Steel tooth circular blades, carbide tipped circular blades, circular saw blades, blades with teeth. 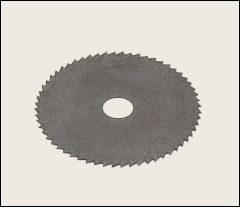 Other circular blades are shown on our Cutting, shaping, grinding tools page. High-speed steel, hardened for cutting plastic, fiberglass, mild steel, and other sheet material. 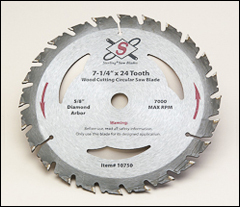 1/32" thick, with a 7/16" arbor hole, and a 5/8" maximum depth of cut when used in the Kett saws listed on our Trimmers page. Also available in 1 1/4", 1 1/2", 1 3/4", 2" and 3 3/8" diameters. The K1468Z has a different tooth pitch which allows blade to be reversed and used in opposite direction. This seems to melt certain plastics less than the standard pitch blades. Sold by the dozen. Maximum RPM: 2,500. Both of the following blades are made from heat treated and surface ground steel plate for heavy work loads. The application specific micro grain carbide stays sharp longer. Oversize tips provide for multiple resharpenings. Copper plugged expansion slots reduce noise and vibration, and help prevent warping. Melamine and laminate circular blade designed with a negative hook angle and a high alternate top-bevel tooth grind, for producing very smooth, chip free cuts in both single and double sided melamine, laminates, and veneers. Also produces smooth cuts in hardwood, softwood, and plywood. Maximum RPM: 6,700. Swirl-free cuts in solid surface materials such as Dupont Corian®, Avonite®, Wilsonart®, Fountainhead® and Gibraltar®. Also produces smooth cuts in hard plastics such as Plexiglas®. Triple chip tooth grind and zero degree hook angle combine to leave a high quality cut. Maximum RPM: 6,700. Tungsten carbide tipped saw blade has a micro grain cobalt binder with a small amount of titanium for added cutting life. Exact tolerance allows for optimum performance. Alternate tooth bevel grind allows for fast-cleaning cuts with framing or general purpose wood cutting. Maximum RPM: 7,000.